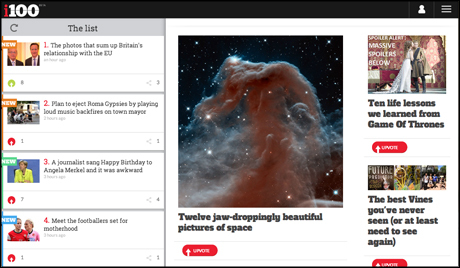 The publisher of the Independent has unveiled a new reader-controlled online news project that aims to be "not just another newspaper website". i100.co.uk, which officially launches today, takes material from the Independent and its concise sister title, the i, and repackages the content into digital-friendly formats including interactive charts, maps, images and lists. The publisher said in an email to beta testers: "Because i100 is from the same newsroom as the i paper and The Independent, you can trust us to take our facts very seriously (even the amusing ones)." Readers are encouraged to socially share material and "upvote" the articles they like most, which affects the order in which stories are displayed. i100's news editor is Matthew Champion, formerly of Metro Online. Also working on the project are Dina Rickman and Evan Bartlett - with support from the Independent's social media editor Felicity Morse. The Independent's digital editor Christian Broughton told Journalism.co.uk: "We've got such an integrated team now. Although they are the dedicated i100 people, there's going to be a whole bunch of people working across sites." The idea arose because, for a long time, the i had no online presence of its own - and when it came to making one the team wanted to try a different approach. Broughton said: "We didn't want to launch just another newspaper website that was similar to others. We've got a unique opportunity here - it's 2014. "The fact that it didn't have a website seemed like an odd thing for a long time, but when you come to make it you realise what a massive opportunity that is. Why would we make it just like all the other websites that have long existed? Why would we just use the same formula? So we didn't." He added: "We knew we had to make it very different. We knew it couldn't just be the paper online. "But its heart and soul is in the same place - it's quality news, it's concise, it's in touch with its readership: social media accounts everywhere, giving people control, saying to people if you want to upvote that story we'll put it at the top of the list. We want people to be involved. We wanted to open it up as much as possible." Readers can sign in through a choice of social media accounts to upvote or comment on articles. As well as seeing their connections behaviour on the site, users receive awards and achievements for how often they vote or share articles. 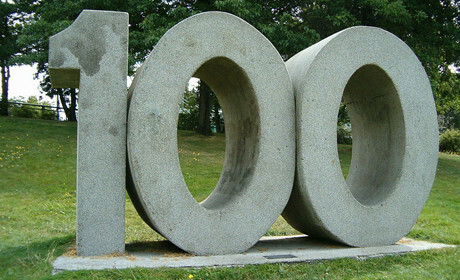 Articles are displayed in a numbered list of 100 down the left-hand side of the desktop version of the site, with the display order based on an algorithm including how old the article is and how well it has been upvoted. The right-hand area contains large graphics linking to highlighted articles. Broughton said: "You don't really believe it until you see it. It works so well to put proper news into an innovative format. When we saw how good the content was we knew we had the right idea. "You'll see some things are told in interactive data charts, others are told in interactive maps, others are lists, some things are just funny ideas off the back of the news that'd be a little too odd to encounter on independent.co.uk. "People are asking me where the homepage is. Maybe it's the 'discover' area. Maybe the home page is our Facebook page. We've got a traditional newspaper website (Independent.co.uk) with a homepage. [With i100] we wanted to put people right in contact with the content." The site also uses the infinite scrolling feature - meaning when a reader hits the end of an article, the next in the list automatically appears beneath. "What do you do when you go online?" Broughton said. "You just want to find something you want to read. Do you really want to keep hitting the back button, going back to the homepage? "There can't be an easier way of navigating than just a numbered list - but if you want to keep scrolling down it's a way of getting to great content."